Towards the end of the match yesterday, I was preparing to write a piece about how, despite a defeat, the performance showed that Arsenal are very much in this title race. But then Hleb played Fabregas through with a piece of exquisite skill, and the Spaniard scored his tenth goal of the season to share the points. It was a game that truly could’ve gone either way. 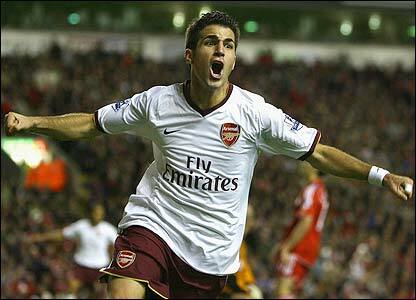 Early in the match, Cesc conceded a sloppy free kick on the edge of the box after miscontrolling. Alonso was certainly looking for the foul, but nevertheless contact was made. The real sin was Flamini breaking from the wall, with Gerrard firing powerfully into the gap he left behind to leave Almunia with no chance. 1-0 down at Anfield early in the game is not a position you ever want to find yourself in, and once again Wenger had cause to hope for his favourite trait, character. He got it in abundance. Adebayor forced a decent save from Reina, and while the Togolese striker had something of an off day, you could never doubt his work rate. But his final touch was poor, once failing to find Rosicky with a flick, shortly after overcooking a simple return ball which would’ve sent Toure through. But the quality of the football was outstanding, passing and moving around Liverpool with ease, but failing with the final ball. In fairness, their last line of defence was working exceptionally well, but for once, Jamie Redknapp made sense, saying that you just knew Arsenal had a goal in them. Elsewhere, in the first half, Carragher put his elbow into Eboue’s face, but once again he made an absolute meal of it, and while Carragher was certainly daft in risking the contact, Eboue’s reputation was always going to make the referee’s mind up for him. Wenger has warned him about it before, and his antics need to stop, and quickly. The start of the second half should’ve seen an equaliser, Eboue showing the positive of his game by slamming a powerful shot on to the post, Cesc shanking the rebound wide of an empty goal. Many have commented that he had time to control and slide the ball in, but his belief in his one touch ability should not be underestimated, and he would expect to bury the chance nine times out of ten. But for all our pressing and deserving of the leveller, you had a feeling that if Liverpool got a second the game would be all over. When Crouch came on for the ineffective and plainly unfit Torres, that outcome looked a realistic threat. The big man forced a couple of excellent saves from Almunia, probably to Lehmann’s disgust, as Liverpool began to assert themselves for the first time in the match. The game changed again with substitutions. Alonso went off, and Gilberto, Bendtner and Walcott replaced Clichy, Rosicky and Eboue. And it was then that Hleb worked his magic. Ignoring the first run of Adebayor, who was offside, and then Bendtner, who was borderline, he slipped Cesc through to toe poke past Reina before he was set. It was sublime skill, and it is astonishing to see his improvement on last season. He has been tremendous so far this term. In the final moments the winner could’ve come from either team. Cesc hit the post with Bendtner ballooning the rebound over when he should’ve scored, while Gallas brilliantly blocked a seemingly goalbound shot at the other end. But a draw was probably a fair result. The papers have gone mad this morning proclaiming how superior we were but I think this is overly one-sided. Our passing was sublime at times, and there is no doubt in my mind that we were the better team, but Liverpool are short of confidence having come back from a damaging loss in Turkey on Wednesday night. Their fighting spirit and dogged defending earned them the point they probably deserved, and lest it be forgotten, kept them domestically unbeaten. I have to mention a few points. The Sky man of the match award to Carragher was a joke, bearing in mind he wasn’t even the best defender on display, and for the second week running got away with a blatant drag down in the penalty area. Eboue is doing my head in. He is so potent going forward, and outrageously gifted, but his play acting and theatrics are harming the team. It is so frustrating to watch his antics slow down a game in which we are pushing forward in earnest. Maddening. Almunia was solid. Of the goals he has conceded in his now extended run in the team, you could only suggest that Sunderland’s equaliser could’ve been prevented. Compare that to Lehmann’s two shockers, and there is no doubt that he has earned his place. It seems to me that the German’s whole argument is that Almunia has won nothing for the team. I suggest that he is worried that this season, that may change, and Arsenal will win trophies without him being required. Don’t be too disheartened this morning. Being disappointed with a draw at Anfield shows just how far this team have come.